Depending on the type of material used to manufacture the syringe barrel, prefilled syringes are available mainly in two types, glass prefilled syringes and plastic (polymer) prefilled syringes. Although the industry is witnessing increasing use of polymer by many manufacturers for plastic syringe manufacturing, and plastic syringe use is expected to increase with the development of improved polymers that offer better leachables and extractables profile, glass is still considered the gold standard and will continue to lead the market in terms of revenue and volume. The market for glass prefilled syringes is expected to lose some of its share at the end of the forecast period, which will be eaten up by the market for plastic syringes that will grow at a CAGR of 25% from 2013 to 2019, states the report. Rapid growth in the biologics market, technical advances in the sector, and rising preference for self-administration using prefilled syringes, autoinjectors, and pen injectors are the major factors driving growth of the global market for prefilled syringes. Currently more than 60% of the drugs under clinical development are biologics and are likely to be approved for parenteral administration. This is because most of the biologics including monoclonal antibodies, vaccines, and anticoagulants, are large molecules that need to be administered via parenteral route to achieve the desired therapeutic effect. Likewise, technical advances related with siliconization and needlestick safety and prevention are also expected to drive growth of the market for prefilled syringes. Based on the promise of the market, there is an increasing number of delivery system companies that provide ready-to-fill/sterile prefilled syringes as well as a rise in contract manufacturers developing the drug for those devices. Several of these suppliers and manufacturers spoke to Drug Development & Delivery about the importance of customization and differentiation as the key to pharma companies staying competitive in the prefilled syringe space. Battelle has extensive experience designing and executing formative and summative usability studies for prefilled injection devices. The company provides turnkey support including: use failure modes and effects analysis (uFMEA) support; protocol development; Institutional Review Board (IRB) coordination; recruiting; data collection; data analysis; and a full range of settings from low-to high-fidelity simulated testing environments. In the past 24 months, Battelle has recruited and tested more than 1,800 subjects and has successfully completed drug delivery device usability testing to help clients achieve two device approvals, with eight more currently under FDA review. To achieve “usability,” Battelle incorporates human centric design into all aspects of its work, beginning with an end-user perspective and incorporating the insights of behavioral and cognitive psychology with design and research elements. “Clients utilize our extensive human factors experience in usability testing to mitigate the risks of their injection devices and ensure that they are meeting regulatory requirements for safe and effective use,” she explains. In the last year, Battelle has partnered with Zogenix to re-envision its 0.5mL DosePro® instantaneous, subcutaneous injection technology for high-viscosity and/or high-volume applications. 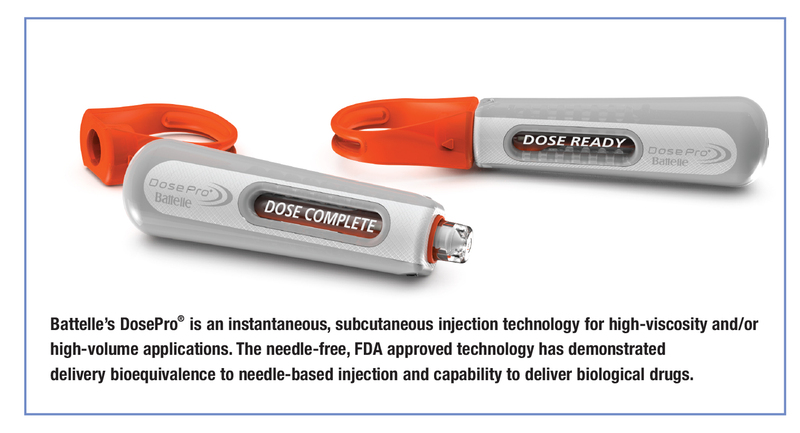 DosePro is a needle-free, FDA-approved technology with demonstrated delivery bioequivalence to needle-based injection and capability to deliver biological drugs. Battelle has generated a development plan for a next-generation device incorporating the needle-free injection engine of the DosePro system with novel patient interfaces. BioPharma Solutions, a business unit of Baxter, partners with pharmaceutical companies globally to support their commercialization objectives by providing formulation development, lyophilization development/optimization, sterile contract manufacturing solutions, parenteral delivery systems, and customized support services to meet the unique challenges that parenteral products face. Additionally, the company can handle liposomals, highly potent, and cytotoxic material. And, according to Tom Tsilipetros, Product Manager, Baxter BioPharma Solutions, this is the only company worldwide certified by SafeBridge doing both parenteral drug substance synthesis and parenteral drug product manufacturing and testing. Mr. Tsilipetros explains that Baxter’s sterile contract manufacturing business, BioPharma Solutions, has several initiatives to address safety, accuracy, and compliance. 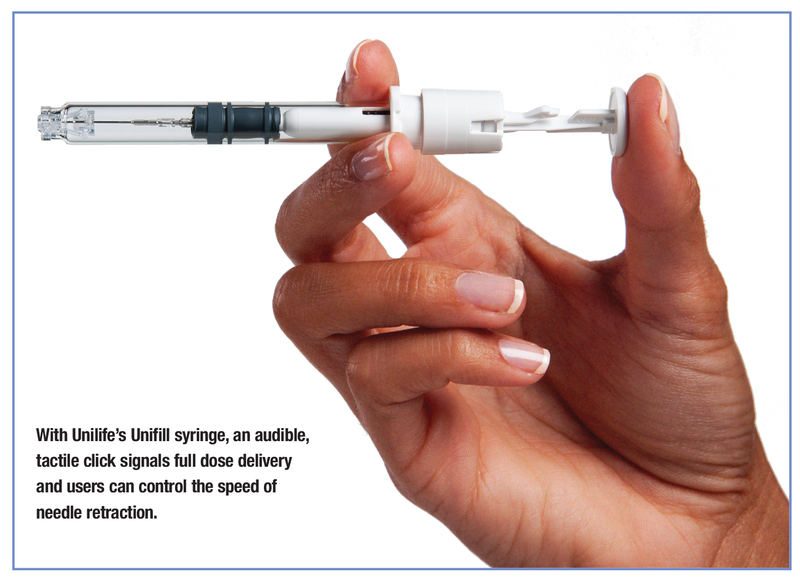 “For example, as potential pharma and biopharma customers approach us with the desire to fill product in a vial at our facility, we take the time to educate them on the benefits of considering a prefilled syringe delivery system instead.” These potential benefits include less steps and decreased risk of needle stick injury to the product administrator, decreased risk of contamination for the patient, greater dose accuracy, and less overfill required resulting in less product waste (i.e. decreased API cost per unit). Additionally, if a customer decides to launch in a prefilled syringe, BioPharma Solutions offers services to aid clients in making a seamless transition of their products from vials to prefilled syringes. As an example, he explains how one client was already in a proprietary syringe, but looking to transition into a newer, superior syringe. To help ease the transition, Baxter’s R&D group designed a study to evaluate 4 different polymer syringes from different suppliers. The study consisted of a lab fill followed by a variety of terminal sterilization cycles and testing both before and after stability storage. Based on the results that were generated from the study, the client selected the polymer syringe that was most appropriate for its product in terms of compatibility as well as meeting quality standards. During projects like this, Mr. Tsilipetros says clients tend to express their needs. Due partly to shortages in the market, many customers expressed a desire for diluents. 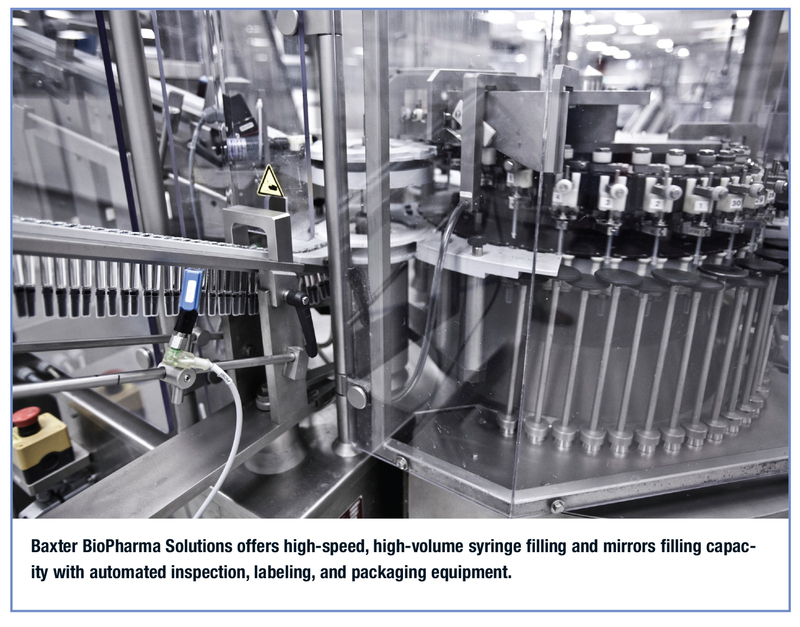 In response, BioPharma Solutions expanded and rolled out a “diluent in a prefilled syringe,” which allowed a client to pick a customized fill volume in a 1, 1.25, 2.25, or 3mL size syringe while leveraging BioPharma Solutions’ drug master files with expiry dating up to 5 years. He explains how one client with a high-concentration monoclonal antibody wanted to deliver in a glass syringe with a staked needle. The R&D group designed a study to evaluate the product’s sensitivity to tungsten and any propensity to aggregate in the presence of silicone. The experiment provided the client with the data to proceed with filling the product in the glass syringe with a staked needle. Baxter continually evaluates how to enhance/evolve its products and services. One area of enhancement being pursued is in packaging assembly. “As many of the items to be packaged are product specific, we have ensured that we have enough space in our packaging area to add custom packaging capabilities,” Mr. Tsilipetros explains. Additionally, the scientific team at Baxter’s Lyophilization Center of Excellence is in the process of developing lyophilization technologies, such as GAP lyophilization, to reduce and optimize lyophilization cycles. Catalent Pharma Solutions has more than 70 years of experience in providing specialized scientific and manufacturing expertise in complex injectable treatments. In sterile manufacturing, Catalent offers a customizable range of prefilled syringe products, fill-finish processes, and specialty delivery vehicles such as auto injectors. The contract developer and manufacturer offers drug formulation services to aseptic and/or sterile filling, visual inspection, and customized packaging for clinical and commercial scale supply, as well as regulatory advice and support. In March, Catalent launched its ADVASEPT™ technology for the advanced aseptic filling of injectable drugs. The new platform provides a glass-free, aseptically filled, primary container that reduces or eliminates many concerns associated with traditional glass vials, including the risk of injuries to treatment providers and patients, and the potential for glass particulate contamination and accidental breakage in transit and subsequent product wastage, explains Rutger Vandiest, Commercial Operations Director for Catalent Pharma Solutions in Belgium. ADVASEPT vial production leverages Quality by Design (QbD) manufacturing techniques that have optimized the blow-fill-seal manufacturing process. Leveraging this form of aseptic processing, a stopper is inserted during the blow-fill-seal process to create a glass-free injectable solution, minimizing the risk of contamination by reducing particles, process steps, and human interaction. Significant reductions in controlled space requirements also drive out the operational and fixed costs of traditional vial filling while decreasing the risk of contamination, explains Mr. Vandiest. 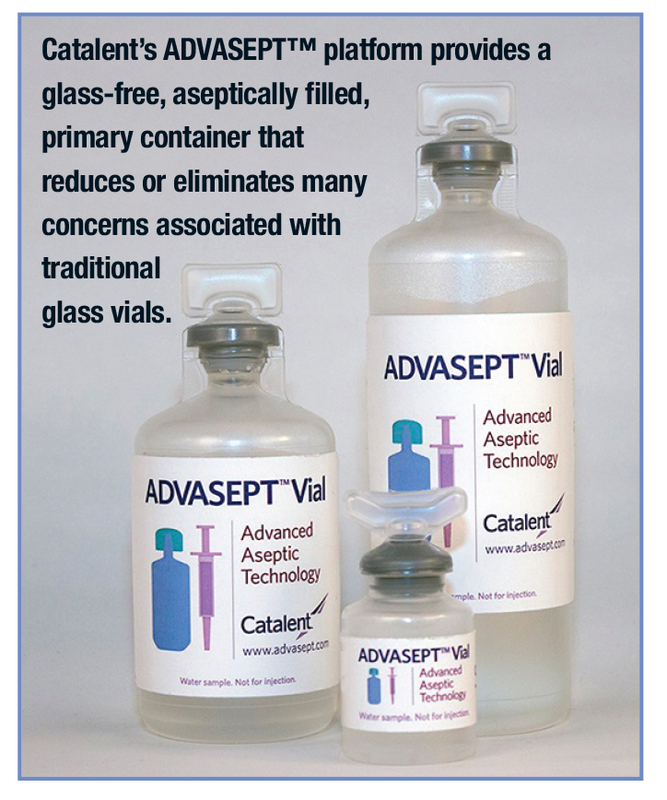 Available with safe, easy-to-open pop-off or twist-off tops, the ADVASEPT vial is currently produced in 10, 50, and 100mL sizes. Lyophilization Technology, Inc. (LTI) provides development, technical support, and Phase I/II clinical supply services. In addition to conventional presentations of product in vials, LTI has the capabilities to develop product formulation and lyophilization process engineering services, as well as offering production of aseptic clinical trial material in cartridges and syringes. 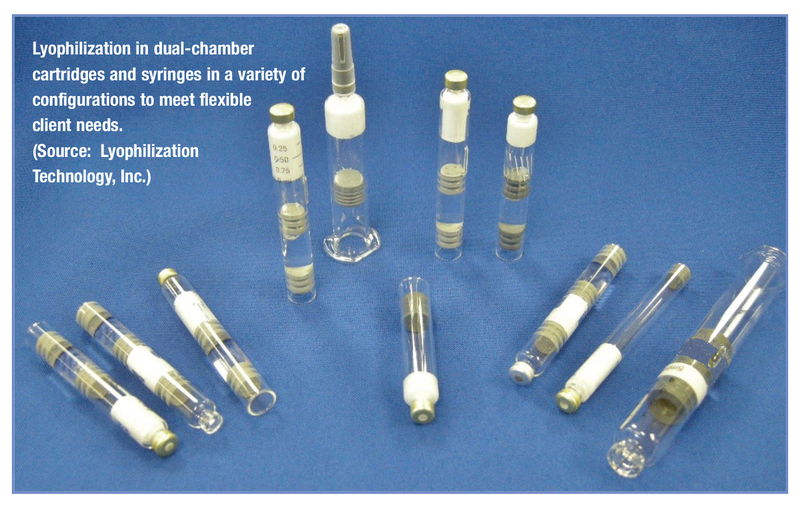 With the emerging trend of home drug administration and the push for patient independence and compliance, lyophilization process engineers can take the process of a traditional container closure system, vial, and stopper, and apply it to the future of drug delivery: the dual-chamber or single-chamber cartridge or syringe. “Being able to successfully apply these concepts to multiple drug delivery formats will benefit the pharmaceutical industry and patient by reducing the time to market, lowering processing costs, and achieving the highest level of product quality,” says Michael S. Thomas, Senior Research Scientist for LTI. Another trend that Mr. Thomas identifies is pharmaceutical suppliers seeking packaging alternatives to suit diverse and complex product portfolios. “This desire for improved product presentations that benefit the health care practitioner and patient is addressed by providing flexibility to drug and device companies by investigating alternative container closure and product combination formats,” he says. LyoGo was in need of consultation, product development, and production of samples to be used as a platform for promoting the delivery system technology. LTI worked with LyoGo to improve product functionality, develop the appropriate lyophilization cycle, and establish processing techniques. On its own, LTI has designed a custom cartridge holding device and a semi-automated plunger insertion device for completing development and clinical manufacturing activities. The custom holding device is suited for increasing heat transfer to the product and minimizing edge effect during lyophilization. This holder also allows for ease of washing, filling, and capping of the containers in aseptic manufacturing. The semi-automated plunger insertion device was designed for ease of aseptic plunger insertion both before and after lyophilization, allowing for various configurations of the cartridge or syringe during processing, as needed. 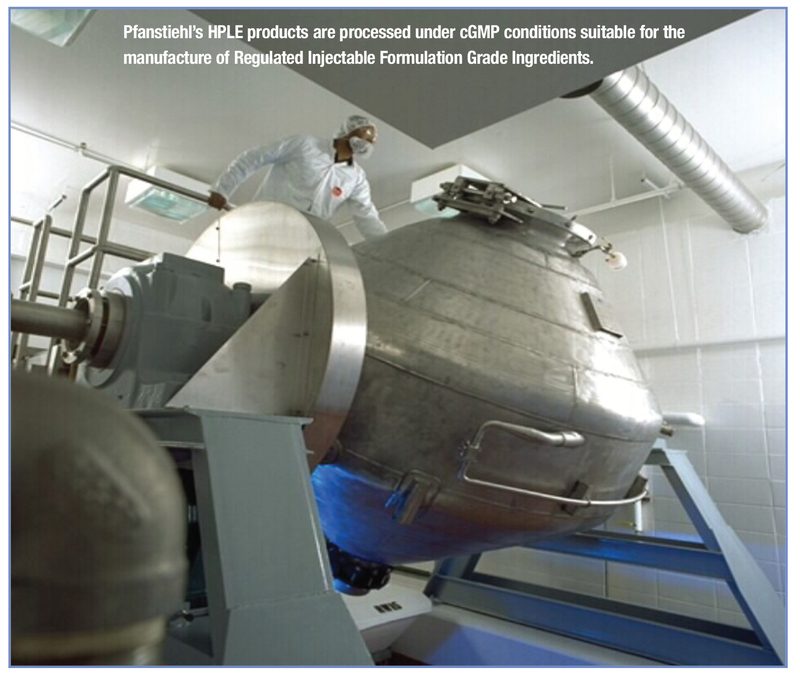 Pfanstiehl is addressing patient safety by manufacturing high-purity, low-endotoxin (HPLE), multi-compendial excipients for use in parenteral formulations. cGMP production of excipients provides a higher level of control and quality assurance for customers and patients. The company is also executing a program of extensive analytical testing of elemental impurities in advance of evolving industry requirements. In particular, excipients such as sucrose, mannitol, trehalose, and maltose are being subjected to rigorous analysis. 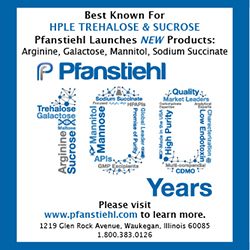 Pfanstiehl recently introduced new high-purity, cGMP-produced mannitol and maltose excipients for therapeutic formulations. Typically, mannitol is used in combination with sucrose or trehalose in lyophilized formulations. However, there are some clients who use mannitol across multiple platforms, in combination with other excipients. Maltose has been historically used in blood fractionation, but has also found utility as a protein stabilizer in liquid formulations. The primary advantage of Pfanstiehl’s mannitol and maltose excipients is the fact that they are produced under cGMP, in a US-based ICH Q7-compliant facility. This provides assurance to developers that each lot of every product is of high quality, consistency, and is fit for purpose, she says. Pfanstiehl will be launching several new products for application in prefilled syringes within the next year. While the details are still not public, they will be a combination of cGMP-quality protein stabilizers and solubilizing excipients. Unilife has created a portfolio of platform-based technologies to address unmet customer needs and emerging market trends for injectable drug delivery. Product platforms include prefilled syringes with integrated needle retraction, drug reconstitution (dual-chamber) delivery systems, auto injectors, wearable injectors, ocular delivery systems, and novel devices. Stephen Allan, Vice President, Marketing & Communications, Unilife, says the market is shifting from a one-size-fits-all approach to flexible platform-based technologies that can deliver the right drug to the right patient at the right time. In the market for generic injectables, the FDA has raised patient safety concerns regarding the use of prefilled syringes for drugs requiring IV infusion. Problem areas include the spontaneous disconnection, leakage or occlusion of medication, and the lack of a prefilled syringe providing universal attachment with any ISO standard needle hub or IV connector. Unilife developed the Unifill Nexus™ and Unifill Allure™ to address these unmet needs. “With the market for generic injectables shifting rapidly to prefilled syringes, we expect our products will provide significant opportunities for customers when it comes to drug differentiation,” comments Mr. Allan. Unilife continues to invest in the research and development of technologies to enable, enhance, and differentiate injectable drugs, biologics, and vaccines. Its LISA™ autoinjector is a new, smart reusable auto injector that allows users to control the speed of needle injection and provides needle-free disposal of a used Unifill syringe. The Unifill platform of prefilled syringes provides automatic and fully integrated needle retraction, making ancillary safety products obsolete, says Mr. Allan. And, Unilife’s EZMix platform of dual-chamber syringes requires only one step to reconstitute or mix a liquid or dry drug combination, eliminating the need for preparation kits or multiple pieces of inventory. 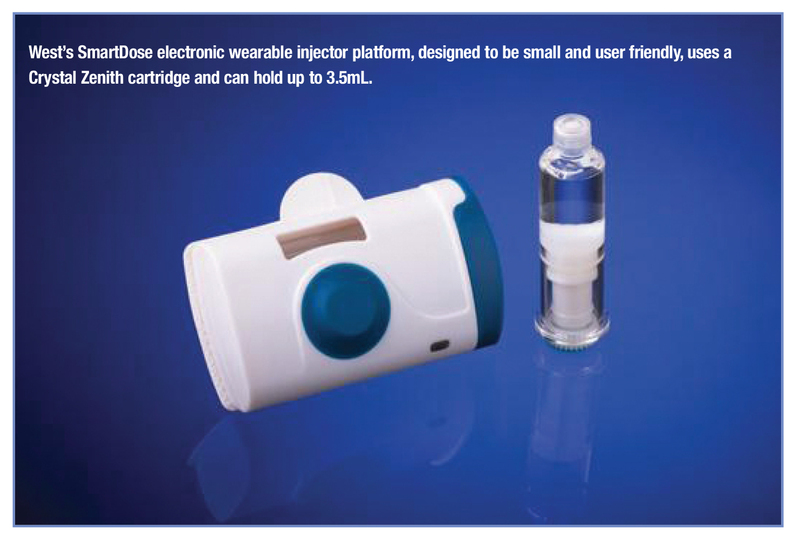 Additionally, the company’s wearable injectors are prefilled, preassembled, and ready-for-injection, requiring no terminal sterilization and accommodating dose volumes up to 30mL. Finally, the Ocu-ject system enables precise, accurate delivery of small dose volumes measured in microliters. Vetter is a full-service provider and strategic contract partner to support drug manufacturers from the early phases of drug development through the approval process, and onto long-term market supply. Vetter provides clinical manufacturing of parenterals in Europe and the US, and supports pharmaceutical and biotech firms. This includes packaging material and consultation on the use of auto injectors and pen solutions. Vetter also provides regulatory compliance support. Services include clinical and commercial filling of liquid and lyophilized substances in vials, syringes, and cartridges. Recent forecasts project a continued growth trend in the injectable sector, but the market is dynamic and continuously changing with ever-growing cost pressures, intensifying competition as well as increasing regulatory demands. 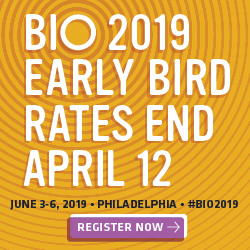 “Because complex biologics will be a major contributor to this development, the need for special requirements and handling provided by novel fill and final packaging solutions will be paramount. To stay competitive, product differentiation is critical and demands high priority,” says Peter Soelkner, Managing Director, Vetter Pharma International GmbH. Biotechnology and pharmaceutical companies outsource their injectable products as a common strategy to stay competitive. The company has established validated processes to handle multi-faceted processes such as siliconization and sterilization that are involved in the prefilled syringe production. In regards to the packaging material itself, a comprehensive and reciprocal supplier management system is vital. Vetter offers a portfolio of primary and secondary packaging options, as well as production capabilities. Sharing information on critical product specifications is very important: robustness of the glass bodies, determining any distress during processing, or the forces applied by the device mechanisms when in use. In addition to addressing these needs, Vetter sees a growing need for support in early-stage compound development. For this reason, the company has expanded its offering to support clients in early clinical-phase production. In addition to a range of small batch non-GMP and GMP filling capabilities, which include flexible and high-quality equipment, Vetter acquired sophisticated lab technology to enable better control of syringe and cartridge siliconization, improved detection of subvisible particles in drug products, and improved ability to simulate commercial-level processes in the development setting. “Taken together, these changes allow an even smoother product transfer to commercial production and market supply,” says Mr. Soelkner. Given the nature of the industry where time and cost are critical and competition fierce, if a customer is planning to launch first with a prefilled syringe rather than vial-only, the prefilled syringe can help differentiate their product. This is particularly true in a market hungry for patient-friendly systems. Moreover, it may be easier to recruit medical clinics for trials that use prefilled syringes since they require less handling and preparation than vials, and have reduced risk of needle sticks. 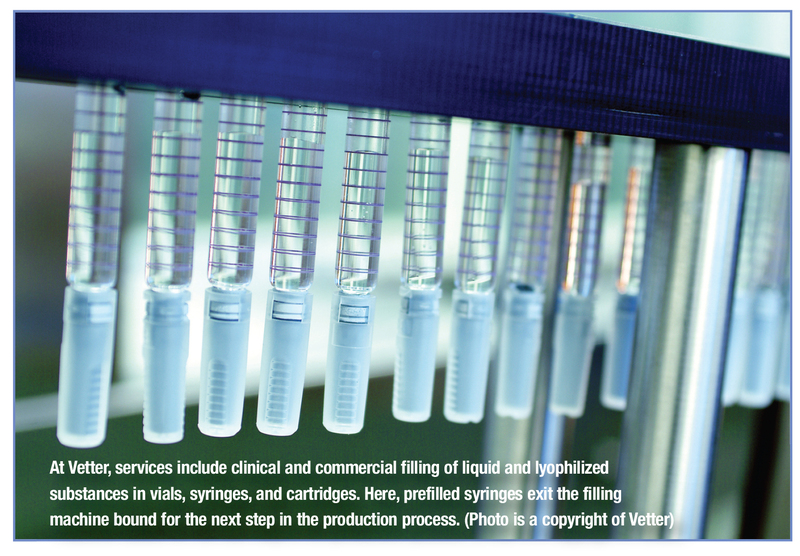 For these reasons, Vetter has introduced the Clinical Syringe Standard Package, which provides customers an all-inclusive service, starting with materials selection that includes the best combination of syringe, needle, and stopper to meet a compound’s requirements, and continues through cGMP clinical syringe filling. A second package called the Clinical Syringe Starter Package starts with the same materials selection, proceeds through feasibility testing and regulatory consultation, and ends with a non-cGMP stability run. “Even if our customer is not planning an immediate launch in a syringe, predetermining syringe feasibility enables a nimble response to a change in market or business priorities. It may also enhance product attractiveness if they are seeking to out-license the product. Both packages are customizable to the needs of the compound and to the business goals of the innovator,” he explains. West offers contract manufacturing and assembly of device components, as well as collaborative development capabilities. West works with customers from early-concept phase through development, scale-up, and manufacture. Many systems require contract drug filling, so West works with contract fillers to ensure that systems can be filled using conventional equipment. West also offers the ability for secondary assembly of device components, including the potential for handling and assembly of the final drug product. A range of contract testing (both physical and chemical), as well as prescreening and extractable/leachable testing, can also be performed. “As drug delivery systems become increasingly essential because of the growth in injectable therapies, treatments require regular injections,” says Kevin E. Cancelliere, Director, PDS Marketing, West Pharmaceutical Services, Inc. “Pharmaceutical and biotech companies are working closely with drug delivery system manufacturers at an early stage to ensure that there is efficient development of an overall system to enable cost-effective drug delivery.” Cost factors may include: the ability to move the product to market as quickly and effectively as possible; reducing in-process rejects caused by breakage or lack of function; and the overall cost of quality, which has to be built into a system from the start. Prefillable syringes can aid in patient compliance, but most are still predominantly based around conventional glass materials, which may cause safety issues such as breakage. Newer drugs, including those with high viscosity or that need to be administered in high volume, can present administration challenges. To address these needs, West has introduced new materials for prefillable syringes and cartridges, including break-resistant cyclic olefin polymers, such as the Daikyo Crystal Zenith® polymer, and designs that allow for easy and safe injection. These systems are manufactured from a polymer that reduces the risks of breakage, provides freedom from silicone oil, tungsten, or adhesives, and features a FluroTec® barrier film applied to the syringe plunger to ensure that the systems provide the benefits of plastic with the features necessary to contain a sensitive biopharmaceutical. After several years of development, West, along with Daikyo Seiko in Japan, scaled-up manufacturing of a 1mL Daikyo Crystal Zenith prefillable syringe system. This is a polymer syringe system with an insert-molded needle and contains no glue or tungsten. The fully validated syringe system is provided in a sterile tub and nest format, and has been designed to be compatible with existing filling equipment. West has collaborated with contract filling service companies to provide customers with a fully integrated system for obtaining a filled syringe that is ready for stability studies. “Several customers are at various stages within their marketing application processes, and we expect that this system will become a syringe of choice for many new or existing biologics where problems of quality, breakage, extractables, and drug interaction could be a challenge with glass syringes,” says Mr. Cancelliere. The-1mL prefillable syringe system and the cartridge for the SmartDose system are based on the Daikyo Crystal Zenith polymer. In addition to a specifically developed and proprietary polymer, the molding, inspection, and final packaging processes have been developed and validated to ensure the highest levels of quality and cleanliness to meet the requirements of customers. The molding process has been developed to incorporate an insert-molded needle, which is secured without the need for adhesives. The specially-designed FluroTec plunger does not require silicone oil lubrication. West’s ConfiDose 315 technology platform with a customized, large capacity (1.5 mL) Daikyo Crystal Zenith syringe offers the opportunity for a smaller, more patient-friendly injection system. Yukon Medical offers several customization services for its products, including primary container compatibility adjustments, modifications for branding purposes, private labeling, and drug kitting, as well as new concept development. Over the past year, Yukon Medical has launched six new vial access devices that provide a safe way to accurately prepare injectable medications. “These products were designed to be easy to use, eliminate needles, minimize residual volume, increase attachment security to the vial, and minimize exposure to vapors and leaks,” explains Todd Korogi, President & CEO of Yukon Medical. There are several versions of varying features and cost, depending on the need for each preparation. Yukon’s Closed Vial Access Device (CVAD) allows a clinician to easily reconstitute and aspirate medication from a drug vial while preventing exposure to hazardous vapors and leaks. 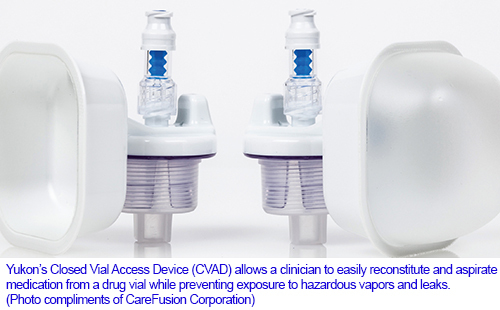 The CVAD contains the vapors and fluid while preventing contaminants from entering the vial. A vapor retention bell provides a barrier to the toxic vapor that is generated during reconstitution of hazardous drugs. The CVAD also utilizes pressure equalization valves that keep the vial at neutral pressure while retaining any vapors produced in the retention bell. In addition to the CVAD, Yukon has launched the vented ViaLok® product line, which features a locking shroud and a 0.2 micron air vent to prevent ingress of microbes and is best suited for non-toxic preparations. 1. Prefilled Syringes Market (Glass and Plastic)–Global Industry Analysis, Size,Volume, Share, Growth, Trends and Forecast, 2013-2019, Research and Markets, http://www.researchandmarkets.com/research/mrs99n/prefilled. 2. The Prefilled Syringe Market report, Roots Analysis, July 2013, http://www.rootsanalysis.com/reports/view_document.html?report_id=18.